Recently, our Chief Tech has had the most interesting experience with a neighborhood robin, whom we've named, "Rowdy," taking an unusual liking to our company A-Appliance Repair van! 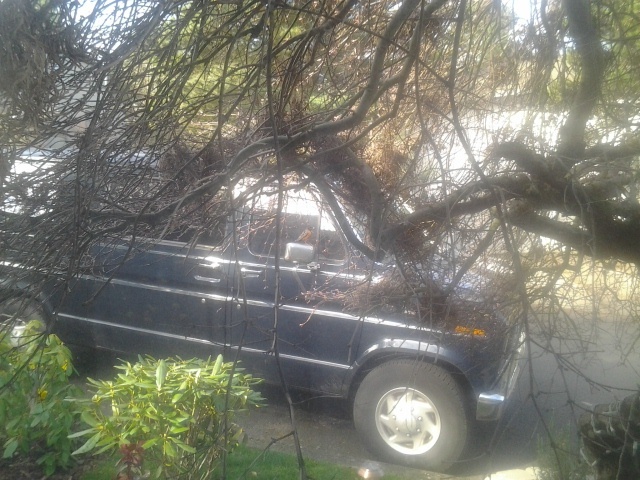 One morning, Kerry went out to start up the van and begin his day. He climbed inside the van and started the motor, just like any other morning, but all of a sudden his attention was caught by a loud buzzing sound outside his passenger side door window - a strange vibration indeed! He looked closer, and to his surprise a large local robin was wildly flapping his wings, buzzing up the side of the window and apparently attacking the van! He thought maybe the bird had inadvertently flown into the window and was stunned or something, so he jumped back out of the van to see what was the matter. The bird then flew off, but not without leaving a hefty bi-product of his recent breakfast behind all over the van's passenger side mirror! Upon closer inspection, Kerry also noted "Rowdy" had left multiple scratch marks on the side door from crazily flapping his wings all over it. Hmmmm. Now, our Chief Tech was somewhat dismayed, thought it was annoying, cleaned off the mirror, and got back in the van. 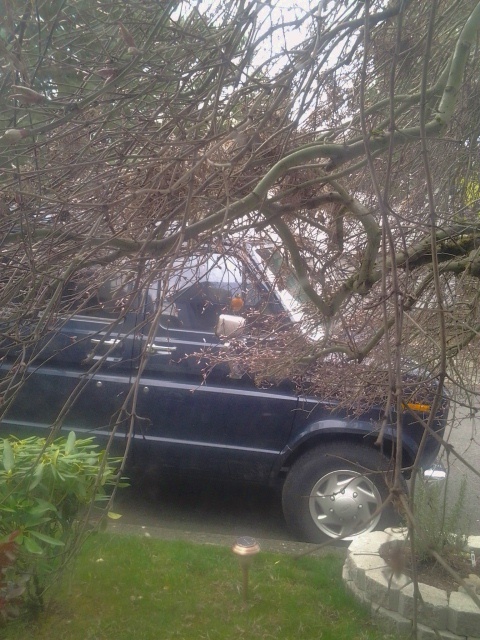 However, Rowdy immediately returned and perched himself boldly again atop the passenger side mirror, and started loudly cherping / bleeping his unintelligible woes to our Chief Tech. Kerry managed to wave the bird away, drove off and didn't think any more of it as he went about the rest of his day. Unbelievably, the very next morning when he went outside to start up the van, there was Rowdy --- at it again, beating his wings against the side of the van! He chased the bird off, again cleaned off the messed-upon passenger side window, and began to wonder what in the heck this bird had going on in his head. Kerry also mentioned it to me, the author, when he arrived home after work that evening. I thought it was very odd, but then the thought struck me that it is Springtime, and all the birdies and animals are staking their annual territorial claims as part of their attempts to find new mates. Weirder still -- did Rowdy actually see himself in the mirror and think it was another male robin that he needed to fight off? Or was he just making a lot of buzzzz to attract a new mate? What could it be? Well, we couldn't figure it out. Rowdy continued his strange morning ritual, complete with mirror-messing, for over a week, and I was then able to catch these camera shots. The bird is bold, let me tell you! Even our two pet kitties watching him from the front window didn't deter him. Then we noticed he was not around for a few days and had huge sighs of relief, hoping Rowdy had finally found a mate and had no more time for van fly-bys. My Gas Dryer Isn't Heating Enough! We want to alert our customers that there is a very common reason for improper heating of gas dryers that you can simply and quickly troubleshoot yourself. The most common cause of this problem with gas dryers is actually restricted airflow. These instructions are easy to follow and can save you an appliance repair service call. 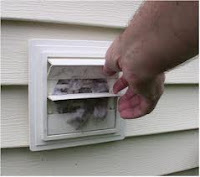 Check the dryer vent that's usually located on the outside of the house to test the airflow. Simply put your hand over the vent while the dryer is operating. If you feel little or no hot air coming out of the vent, then you've got an airflow problem! Next, open the dryer door and check the lint trap, which is often located inside the dryer at the bottom of the door opening. Remove the lint filter and simply clean out any lint build up that you can see in the trap itself. Some people like to use a small cleaning brush to do this - see photo at right. In addition, if there is any restriction inside your gas dryer's external venting system, the clothes will take forever to dry. So it's important to look behind the dryer to ensure the vent duct hose has connection to both the dryer itself and to the outside vent. Carefully move the dryer away from the wall, if you need to go behind it to more closely inspect the vent hose. If the vent hose has a dent in it or is partially smashed, you will have little to no airflow and will need to try to reform the tubing so that it isn't dented or partially squashed, in order to get maximum airflow. Now you can look to check the vent for any lint build-up or other obstructions inside the dryer duct. 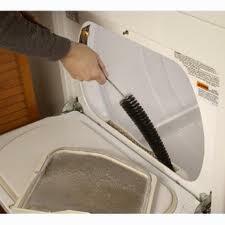 If there is lint build-up inside the duct, simply remove the lint and clean it out as best you can. It's a good idea anyway to do this general maintenance once yearly to avoid airflow restriction in your gas dryer and potentially costly repairs. The second place where excess lint causes restriction in airflow is in the actual dryer vent duct tubing. If there's too much lint build-up in the vent exhaust tubing, as in the photo at left (top), and it's too much for your vacuum to clean out, it might be best to just replace the vent tubing altogether. If it does not appear to be that severe, you can try to simply remove the excess lint by vacuuming it out. If you've performed these troubleshooting steps, and the dryer is still not heating properly, please give us a call to schedule a service call! We will get you on the service schedule quickly and perform any repairs needed for your gas dryer to restore it to proper heating function.